While there are over a handful of night markets that one can check out in Taipei, the Rao He Night Market (饶河夜市) is home to some of the best tasting street food one can find in the city of Taipei. If you have not seen my previous article on Tong Hua Night Market (通化夜市), you should definitely consider checking out the place as well! What to Eat at the Rao He Night Market (饶河夜市)? If you have never been to Rao He Night Market, the first thing you will notice when you get there is the line near the entrance (or the exit, depending on where you come from). When I got there on a cold rainy night, people were still braving the cold for a taste of the famous Hu Jiao Bing (胡椒餅), which translates into Pepper Biscuit literally. Once you get past the crunchy exterior of the pepper biscuit, you will find yourself in flavour-heaven. The delicious and savoury insides are filled with hot peppery goodness - you definitely have to eat this one hot (don't bother taking-away this snack)! 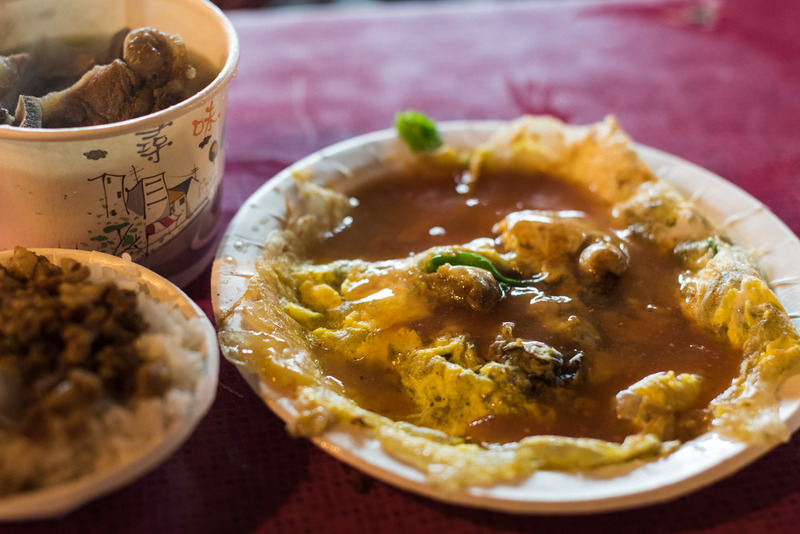 As you walk along the Rao He Night Market, you will probably find yourself drifting towards the rich aroma of the Herbal Pork Rib Soup store that is set up in the middle of the night market. For those of you who do not like to consume pork, there is also a lamb version (although I do think the former version is a lot better). I have been to this store a couple of times and I have had a little bit of a disappointment the last time I went because for some reason, the soup just wasn't intense enough. The braised pork rice is also pretty decent and it goes very well with the soup - do note that it does get a little dirty and messy (especially since you'd be seated really close to other diners). The oyster omelette in my opinion is something that you should skip - just focus on the soup really! Another street food to try out in Rao He Ye Shi has got to be the Tu Ji Dan Qi Si (土鸡蛋起司) which translates directly into Chicken Egg Cheese - think about it as a blend of runny egg yolk and melted cheese inside a soft and fluffy shell. There are a couple of other flavours but this flavour has got to be the most popular one! The delicious pepper biscuits are a good enough reason to check out the Rao He Night Market. Also, if you are looking for souvenirs and gifts like the famous ginger tea, you should be able to get them around the night market for a really good price. How to get to Rao He Night Market (饶河夜市)?